As you can see from the release notes, CUDA 3.1 also gives 16-way kernel concurrency, allowing for up to 16 different kernels to run at the same time on Fermi GPUs. Banks said a bunch of needed C++ features were added, such as support for function pointers and recursion to allow for more C++ apps to run on GPUs as well as a unified Visual Profiler that supports CUDA C/C++ as well as OpenCL. The math libraries in the CUDA 3.1 SDK were also goosed, with some having up to 25 per cent performance improvements, according to Banks. The support for recursion and concurrent kernels should be great for CUDA path tracers running on Fermi and I'm curious to see the performance gains. Maybe the initial claims that Fermi will have 4x the path tracing performance of GT200 class GPUs could become true after all. As it stands right now, the service is -- perhaps shockingly -- running as intended. OnLive still requires a faster than normal connection (regardless of what the folks from OnLive might tell you), and it requires a wired one at that, but it absolutely, unbelievably works. Notice I haven't mentioned issues with button lag? That's because I never encountered them. Not during a single game (even UE3). What he stressed most, though, was Perlman's other company, Mova, working in tandem with OnLive to create impressive new visual experiences in games. "This face here," Bentley began, as he motioned toward a life-like image that had been projected on a screen before us, "is computer generated -- 100,000 polygons. It's the same thing we used in Benjamin Button to capture Brad Pitt's face. Right here, this is an actress. You can't render this in real time on a standard console. So this is the reason OnLive really exists." Bentley claims that Mova is a big part of the reason that a lot of folks originally got involved with OnLive. "We were mind-boggled," he exclaimed. And mind-boggling can be a tremendous motivator, it would seem -- spurring Bentley to leave a successful startup for a still nascent, unknown company working on the fringes of the game industry. In fairness, what we saw of Mova was terrifyingly impressive, seemingly crossing the uncanny valley into "Holy crap! Are those human beings or computer games?" territory. Luckily for us, someone, somewhere is working with Mova for games. Though Bentley couldn't say much, when we pushed him on the subject, he laughed and responded, "Uhhhh ... ummm ... there's some people working on it." And though we may not see those games for quite some time, when we do, we'll be seeing the future. 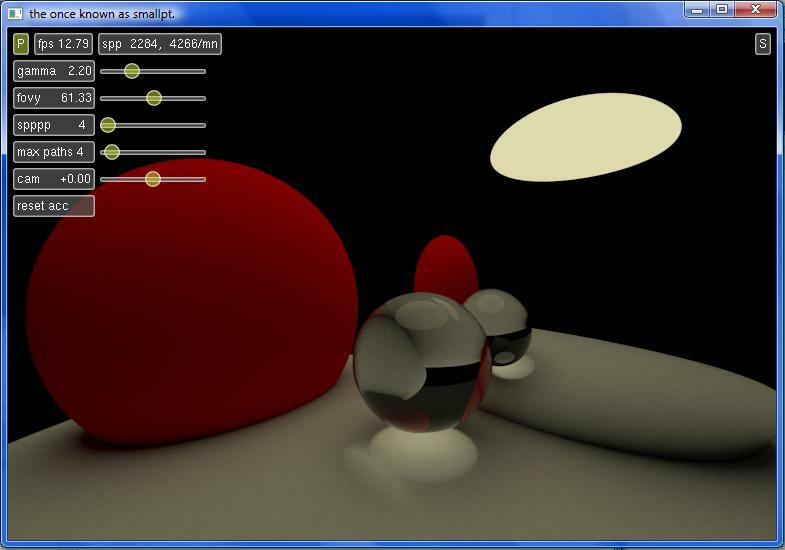 Real-time Energy Redistribution Path Tracing in Brigade! A lot of posts about Brigade lately, but that's because the pace of development is going at break neck speeds and the intermediate updates are very exciting. Jacco Bikker and Dietger van Antwerpen, the coding brains behind the Brigade path tracer, seem unstoppable. The latest contribution to the Brigade path tracer is the implementation of ERPT or Energy Redistribution Path Tracing. 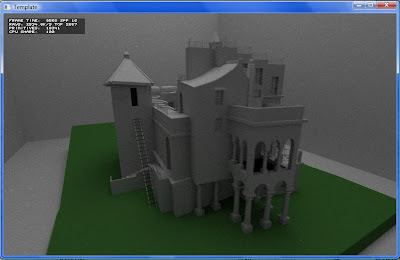 ERPT was presented at Siggraph 2005 and is an unbiased extension of regular path tracing which combines Monte Carlo path tracing and Metropolis Light Transport path mutation to obtain lower frequency noise and converge faster in general. Caustics benefit greatly as well as scenes which are predominantly lit by indirect lighting. The original ERPT paper can be found at http://rivit.cs.byu.edu/a3dg/publications/erPathTracing.pdf and offers a very in-depth and understandable insight into the technique. A practical implementation of ERPT can be found in the paper "Implementing Energy Redistribution Path Tracing" (http://www.cs.ubc.ca/~batty/projects/ERPT-report.pdf). 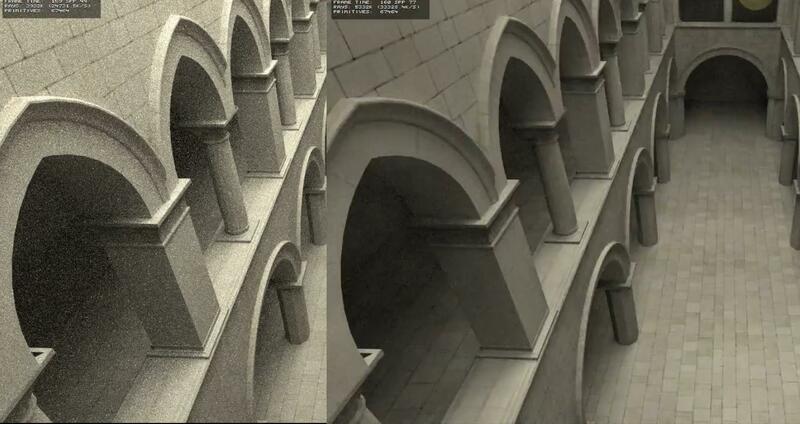 The algorithm seems to be superior than (bidirectional) path tracing and MLT in most cases, while retaining it's unbiased character. And they made it work on the GPU! You could say that algorithm-wise, the addition of ERPT makes Brigade currently more advanced than the other GPU renderers (Octane, Arion, LuxRays, OptiX, V-Ray RT, iray, SHOT, Indigo GPU, ...) which rely on "plain" path tracing. ERPT seems to be a little bit darker than regular path tracing in this image, which seems to be a by product of the noise filters according to http://pages.cs.wisc.edu/~yu-chi/research/pmc-er/PMCER_files/pmc-er-egsr.pdf. Sparse voxel octree and path tracing: a perfect combination? I have been wondering for some time if SVO and path tracing would be a perfect solution for realtime GI in games. Cyril Crassin has shown in his paper "Beyond triangles: Gigavoxels effects in videogames" that secondary ray effects such as shadows can be computed very inexpensively by tracing a coarse voxel resolution mipmap without tracing all the way down to the finest voxel resolution, something that is a magic intrinsic property of SVO's and which is to my knowledge not possible when tracing triangles (unless there are multiple LOD levels), where all rays have to be traced to the final leaf containing the triangle, which is of course very expensive. 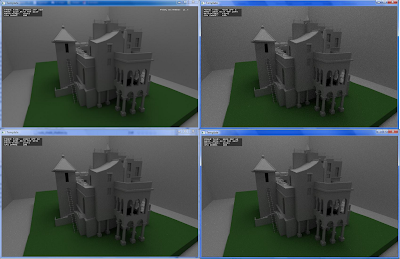 A great example of different SVO resolution levels can be seen in the video "Efficient sparse voxel octrees" by Samuli Laine and Tero Karras (on http://code.google.com/p/efficient-sparse-voxel-octrees/ , video link at the right, a demo and source code for CUDA cards is also available). I think that this LOD "trick" could work with all kinds of secondary ray effects, not just shadows. 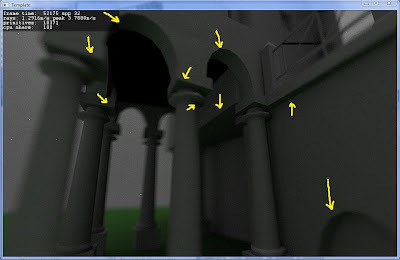 Particularly ambient occlusion and indirect lighting could be efficiently calculated in this manner, even on glossy materials. One limitation could be high frequency content, because every voxel is an average of the eight smaller voxels that it's constituted of, but in such a case the voxels could be adaptively subdivided to a higher res (same for perfectly specular reflections). For diffuse materials, the cost of computing indirect lighting could be drastically reduced. 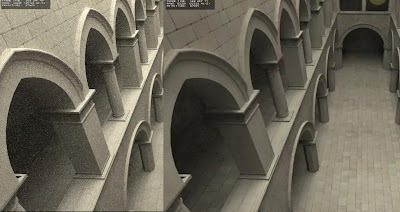 Another idea is to compute primary rays and first bounce secondary rays at full resolution, and all subsequent bounces at lower voxel LODs with some edge-adaptive sampling, since the 2nd, 3rd, 4th, ... indirect bounces contribute relatively little to the final pixel color compared to direct + 1st indirect bounce. Not sure if this idea is possible or how to make it work. Voxelstein3d has already implemented the idea of pathtracing SVOs for global illumination (http://raytracey.blogspot.com/2010/03/svo-and-path-tracing-update.html) with some nice results. 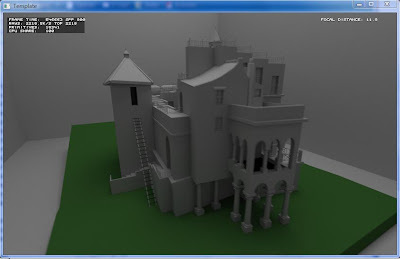 Once a demo is released, it's going to be interesting to see if the above is true and doesn't break down with non-diffuse materials in the scene. Although the scenes are quite simple (spheres and planes only), it's extremely fast and it converges literally in a matter of milliseconds to a high quality image. Navigation is as close to real-time as it gets. There are 4 different scenes to choose from (load scene with F9) and they can be modified at will: parameters are sphere size, color, emitting properties, 3 material BRDFs (diffuse (matte), specular (mirror) and refractive (glass)) and sphere position. Path trace depth and spppp (samples per pixel per pass) can also be altered on the fly thanks to the very convenient GUI with sliders. When moving around and ghosting artefacts appear, press the "reset acc" button to clear the accumulation buffer and get a clean image. Definitely worth messing around with! Follow the link in this post to download. There's some new features + performance increase. Rename cudart.dll to cudart32_31_9.dll to make it work. 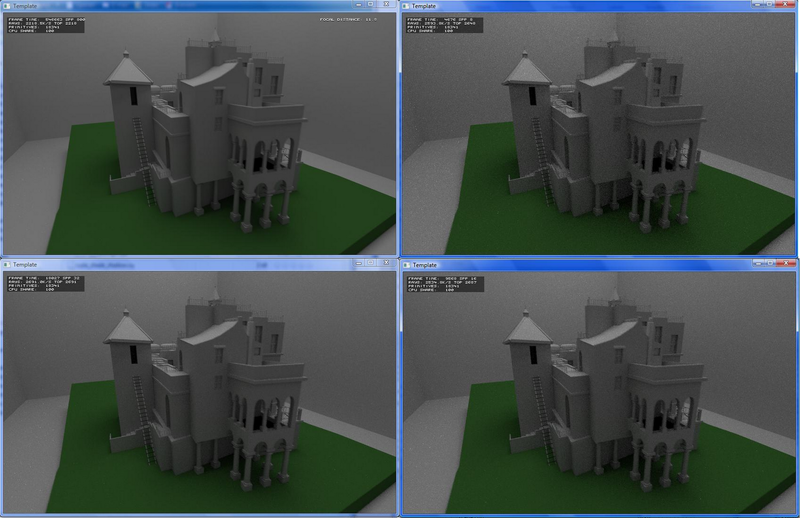 all of these contribute to the photorealistic look and it's all interactive (on high end cpu+gpu)! Gaikai focuses on delivering game demo's, not complete games: you see an advertisement of a game on a website (could be Gamespot, EA.com, Eurogamer) or read a game review, and with just one click you can play a demo of that game in your browser without paying a cent. The game publisher pays for your playing time, 1 cent per minute per user. This approach is economically safer, more practical and more retail/publisher/gamer friendly than what OnLive is doing. With the current network infrastructure of the internet and its bandwidth limitations, this is probably the most successful route for cloud gaming. Gaikai has already signed EA (http://games.venturebeat.com/2010/06/17/gaikai-signs-ea-as-digital-distribution-partner/), so I think cloud gaming is gonna get big pretty soon.